My family trip to Marrakesh was a great life lesson for my children ( and me). They sometimes forget how lucky they are. To start with there is no compulsory education yet most children go. I couldn’t work out what age they stayed in education though. But there is no attendance record and missing children isn’t seen as an issue just a way of life. My son thought this was great until the tour guide took us round the Souk. An area full of shops and small workshops and I mean full. It had 10 yr olds working along side adults. In fact we were introduced to a 90 year old man who made shoes ( lovely hand made items) and had done so for years. He made one pair a day with his 12 year old apprentice, both crammed in a small cupboard with no sunlight. The tour guide pointed out that leaving school didn’t mean leaving education. In fact from puberty boys have to attend religious lessons until the day they die and have to pray 5 times a day. Suddenly schools seemed more appealing to my son. Lessons were a couples of hours in the morning and then a long lunch break because family time is important, in fact family and it’s privacy was paramount. You only have to look at the high plain walls hiding the elaborate and amazing hidden courtyards and tiled houses to see how much they protect their family privacy. Others including teachers rarely seem to know what is going on behind those doors. The long lunch breaks also seemed to involve jobs for the children, collecting bread was one which stunned my children. A five year old came into the bakery on our tour to collected the 25 loaves his mother had prepared that morning and as he struggled to carry them all, he couldn’t understand why 7 tourists were watching him in amazement. 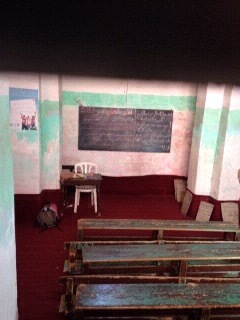 Children then went back to afternoon lessons, including Maths and French. They seemed more used to tourists visiting and knew how to play the game, saying thank you in a chorus fashion to the books and pencils that we had brought them. The classroom was a big eye opener for my children. I have attached a photo. It put my children’s complaints about uncomfortable chairs and too many books to carry into perspective. The children were all wearing good quality clothes although looked like well worn hand me downs. They walked to school or were driven on the back of scooters without helmets balanced precariously. They played in the street with footballs and makeshift goals. No gymnastics or cricket equipment to be found. My daughter quickly realised that things were different if you are a girl. To start with, I made her think about what she was wearing. Normally she just wears what she likes, but now there were rules. Then there were less girls in the school and we never saw one girl playing on the streets, just a few helping with younger siblings. However every child we saw was always smiling or singing songs which confused my children. How can their life be so hard but they seem so content. The tour guide had an interesting answer, no social media! I will leave that for them to ponder. The whole trip was fascinating and from a safeguarding and mental health point of view gave me lots to think about.